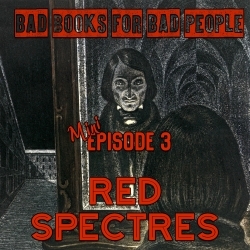 Red Spectres, translated and edited by Muireann Maguire, collects examples of a rarely-seen side of Gothic literature, tales produced in the early days of Communist rule in Russia. These macabre stories have many of the elements familiar to Western readers including ghosts, evil doubles, and mad science, while representing a worldview unique to the time and place in which they were created. How well do totalitarian regimes and fantasy stories mix? What were some of the very real dangers faced by the authors of these works? Is there an audience for nihilist Top Gear? Find out all this and more in the latest mini episode from Bad Books for Bad People.